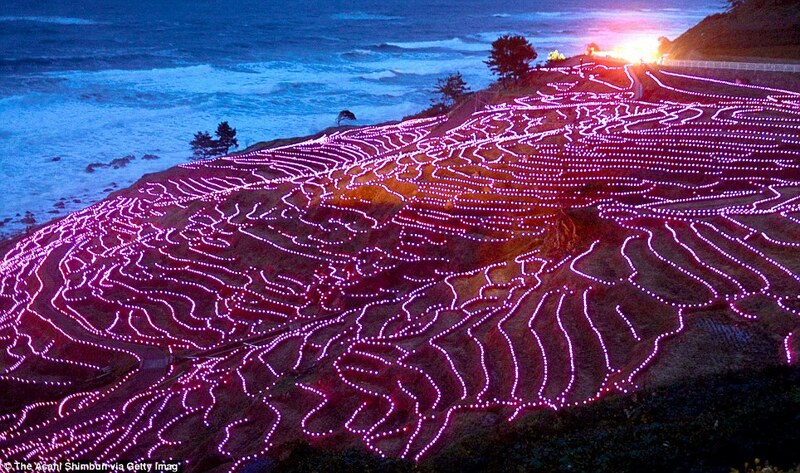 The Shiroyone Senmaida rice paddies in Ishikawa, registered both in the Guinness Book of World Records for having 20,000 pink LEDs, and as a Globally Important Agricultural Heritage System (GIAHS). BIOFUELS are yet another example of how good intentions create unintended results that cause more problems than the one they set out to solve. Farmers in both developed and undeveloped countries can get more cash for their grain crops by selling them for fuel conversion rather than as food. Food shortages caused by the lack of affordable grain was one of the reasons for the political unrest in Tunisia and Egypt. 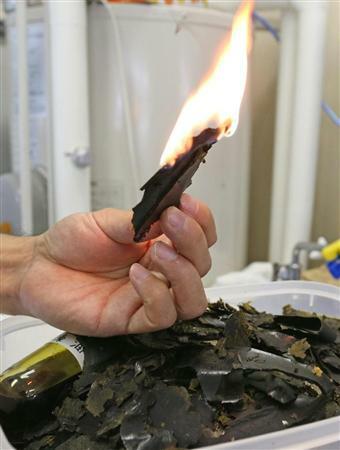 Some scientists are examining the use of other materials for biofuel use, and one of those materials is algae. They generate hydrocarbons when they grow and when their cells divide. But algaculture for fuel use has been impractical because the process of obtaining oil in quantity from them is slow and difficult. That might be changing. Two years ago, Prof. Enomoto Taira of Kobe University discovered a variety of the botrycoccus alga that reproduces by photosynthesis alone and multiplies 100,000 times greater by volume than other botrycoccus in one month. It also produces a quantity of hydrofuel equivalent to 30 times its weight. In fact, it has the highest energy production of any alga in the world and more than 100 times the energy production per unit of area cultivated than other biofuels. Prof. Enomoto is working with the Japanese companies IHI Corp., Gene and Gene Technology, and the Neo-Morgan Laboratory Inc. to improve and commercialize the process of fuel conversion using the alga that has been named after him. The hydrocarbon produced is said to be suited for use as fuel oil. Another advantage of the alga is that it’s said to be robust, which means that it could be grown in the open in ponds instead of photobioreactors. Problems remain to be resolved, and they’re still in the process of developing cultivation techniques and facilities. It’s not economically competitive yet, because the fuel product now costs JPY 1,000 yen per liter. If science has its way, however — making everything smaller, cheaper, and faster — those problems will eventually be ironed out. No, it shouldn’t. And that might help Japan reduce its level of energy dependency. It would also allow grains to be used for food again, instead of biofuels — which gobble up 40% of the American corn crop and nearly 20% of British wheat and corn production. People don’t eat algae. Well, yes they do. It is an ingredient in some food products, including ice cream, and it’s used for supplements. But you know what I mean. Speaking of slime, it’s time to let some rip with Rip Slyme. The group chose that name because RIP were the initials of the names of three founding members, and the Mattel-manufactured toy product Slime was popular at the time. I prefer the name Sunshine and Bikinis, which is the name of this song. It’s also got a pink Cadillac, if you can tear your eyes away from the other performers. 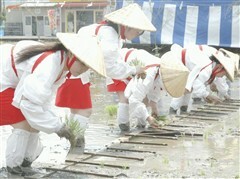 Harvesting rice at a nukihoshiki ceremony in Ube, Yamaguchi. The rice will be used as an offering. Here’s a video condensation of the same event at a different location from start to finish, from the inside out. Excellent! 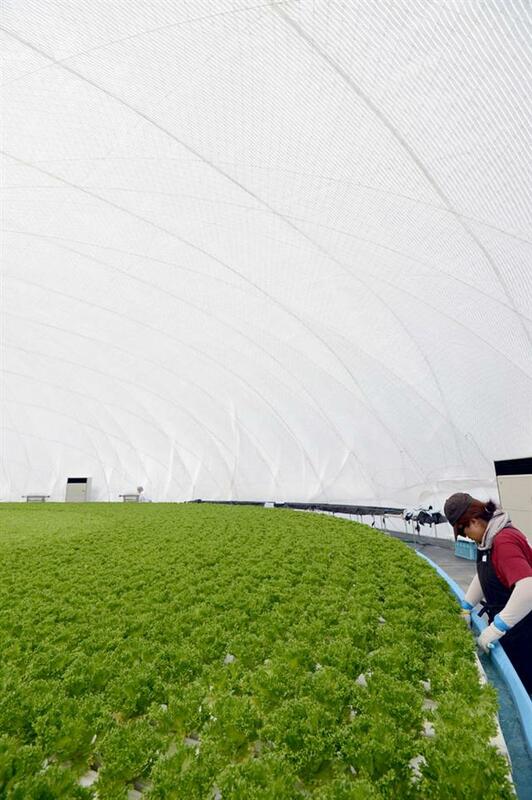 Airdome lettuce in Rikuzentakata, Iwate, which was severely damaged in the Tohoku earthquake and tsunami. 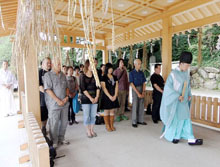 Photo from the Sankei Shimbun. FARMERS love ladybugs because they’re the natural predators of aphids, scales, mites, moth larvae, and other natural predators of their crops. That’s why they love to have ladybugs make a habit of hanging out at the farm. But the problem is one of unrequited love — the farmers can’t make them stay once they get there. They have wings and fly away, even when they’re released in a greenhouse. Ladybugs just got to be free. Seko Tomokazu and his team at the National Agriculture and Food Research Organization in Fukuyama, Hiroshima, got to work on a way to neuter that flightiness. The team used measuring instruments to find and isolate the ladybugs that had trouble flying. They got them to mix and mingle, and finally succeeded in producing a landlubber strain that doesn’t fly at all. It just walks. Put one on a stick, and it strolls to the end and back down again without taking off. In other words, the scientists turned an inherited drawback for coccinellidae into an advantage. 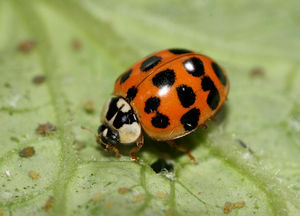 Ladybugs can produce up to seven generations in a year, and it took from 20-35 generations to breed a master race of flightless aphid eaters. After all that effort, their next step was obvious. They registered it with the Agriculture Ministry as a biological control agent. Time to make some money off those bugs! Here’s a Youtube that’s a slice of life its own self. Watch as a ladybug wolfs down an aphid. Who knew they were so ruthless? * The TPP might or might not be an American strategy, but to be clear about it, that doesn’t have anything to do with Japan. The critical point is only what Japan will do. That is the point of departure, but many people think first of the other party’s intentions. To think first of the other party’s intentions without thinking of your own strategy is not an intellectually independent stance. * Mixed healthcare (i.e., insured and non-insured) will not come up in TPP. The opponents insist that it will, but maybe that’s a good idea. The TPP will not particularly demand that agriculture be conducted by large business enterprises. Unless it is, however, the producers won’t survive, and it will also benefit the consumers. At any rate, the issue is what Japan will do. The U.S. doesn’t really have anything to do with it. * It’s the basic principle of negotiations to start only with proposals that benefit you. To say that you won’t negotiate because the other party looks tough is defeatism. * I’m saying that I favor lifting the restrictions on mixed healthcare and corporate agriculture. I’m not saying that I agree with the United States. That mistake is short-circuited thinking, and it is not an argument. I really, really understand that some people in both sectors are against that. They’re the ones I’ve been opposed to from the start. * I am opposed to the vested interests of the Medical Association and the agricultural cooperatives. Large scale agriculture at a high level of quality should be the policy for survival. If the United States recommends that policy to Japan, I’m in favor of it. That is not playing the footman to the U.S. Japan should do what it should do. * The people who are uneasy about the safety of food from abroad are saying that they trust the Japanese government’s determination of food safety and distrust that of foreign countries. 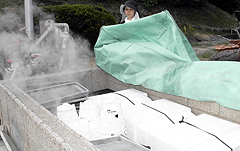 The Japanese government is responsible for the nonsense that a radiation standard of 500 Bq per kilogram is acceptable. I do not understand why they trust the government here but not those abroad. * The opponents of TPP bring up the self-sufficiency ratio of food. If high numbers are so good, the North Koreans don’t have any imports and their ratio is nearly 100%. Numbers such as these for Japan alone have no meaning at all. Cheaper rice is a good thing. Politicians can solve almost any problem — usually by creating a bigger problem. DISCUSSIONS to create free trade agreements are always a bit like negotiating one’s way through a briar patch, regardless of the parties involved. The case for free trade isn’t easy to make, and appeals to our hard-wired tribalism often find a resonance whose amplitude far exceeds the input. Another complication is the natural tendency of countries to advocate the liberalization of those sectors in which they have an advantage and to get all huffy about industries in which they are at a disadvantage. 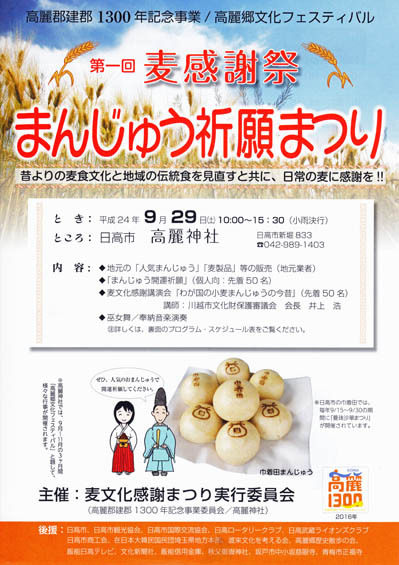 In short, to understand the role of rice in Japanese life, it might be useful to imagine how Westerners of an earlier age must have viewed wheat based on the line in the prayer, “Give us this day our daily bread”, and then multiply it by a power of three. Now imagine the response of some people in Japan when they learn that the Trans-Pacific Strategic Economic Partnership Agreement, known as TPP, would eliminate all tariffs among member states in 10 years without exception — including rice. All of these factors should be taken into consideration by anyone overseas who would report or comment on the debate in Japan over joining the discussions for the TPP, but that won’t happen with the Western media or its on-call stable of bite-sized quote generators in academia. Former Prime Minister Kan Naoto briefly glommed onto the idea in his Sisyphean search for a policy that would endow him with political legitimacy. But Mr. Kan soon fluttered over to some other issue — his priority was to prolong his survival in office, his interest in the matter was tepid and transitory, and even he knew he lacked the skills to either persuade or bulldoze the farming communities, the roughly 50% of his own party opposed to participation, and the agricultural lobby in the bureaucracy. His interest was so superficial, in fact, he carried out a Cabinet reshuffle after bringing up the issue of TPP participation and retained an agriculture minister opposed to the idea. Now the new government of Noda Yoshihiko is eyeing the potentially poisonous fruit and wondering if it should take a bite. His government and the ruling DPJ will decide early next month whether Japan will take part in the TPP talks. (Mr. Kan was supposed to have decided early this summer, but the prompt execution of affairs is not the hallmark of DPJ governments in general or Mr. Kan’s in particular.) Their decision seems to be timed to coincide with the APEC summit. Author and university professor Ikeda Nobuo has added TPP Bomeiron to his list of “books that must not be read” (either at the top or bottom, depending on your perspective). He dismisses it as a 200+ page rehash of two false arguments: (1) TPP is a de facto American FTA, and (2) The increase of imports in TPP will result in deflation. Others who urge caution warn of being bulldozed in the negotiations by the United States. Superficially, it would appear they have a point; Japanese negotiators seem to be congenitally incapable of defending themselves against American pressure in any negotiations. Yet this argument ignores Japan’s partial ban on U.S. beef imports that has remained in effect since 2005 due to mad cow disease. Only meat from those cattle aged 20 months or younger is allowed in the country. Meanwhile, DPJ member and former Agriculture Minister Yamada Masahiko is mobilizing opposition within the party. He also claims that half of the DPJ MPs are opposed to participation, and insists this is not an issue requiring urgent action. His estimate of half might have been too low. It’s now reported that he’s collected 191 signatures from party members in the Diet backing his opposition. Japan’s Ag Ministry bureaucrats, agriculture industry groups, and their allies in the Diet haphazardly oppose any attempts at liberalization without thinking of the future benefits. When the government wanted to liberalize banana imports, the apple growers of Aomori were fiercely opposed. They claimed they would no longer be able to sell apples. When the import of bananas finally was liberalized, the farmers made improvements to Aomori apples and were able to supply a greater variety. Today, they are exported to Taiwan and China, and domestic consumption has also risen. An Oct. 12 meeting of DPJ lawmakers opposed to or skeptical about this proposal focused on issues related to the health-care and pharmaceutical industries. At the meeting, senior executives of the Japan Medical Association warned that the deregulation of these industries resulting from Japan’s participation in the accord would cause the health-care system in Japan to collapse. Foreign Ministry officials in charge of the TPP pointed out that a public health-care insurance program is not covered by the TPP negotiations, but the participating legislators refused to be reassured. No one has ever gone broke underestimating the intelligence of the average politician. Then again, an intelligent person is unlikely to go into politics to begin with. Despite the broad unsupported assertions, verbal sand-throwing as a diversionary tactic, and superficial commentary, the Japanese public is being offered counter-arguments and is finding those arguments to be worth their consideration. Mr. Asakawa holds that the argument claiming Japanese agriculture is weak lacks a basis in fact. He claims that the Agriculture Ministry deliberately understates the agricultural self-sufficiency rate to maintain a crisis atmosphere among the public as a means to enhance its influence. He insists that the industry has successfully boosted production, that a decline in the farming population will not result in the waning of agriculture, and that Japan has enormous potential for becoming a food exporter. This previous post summarizes an article in the September 2009 issue of Voice, which features an interview with Itochu Corp. Chairman Niwau Ichiro. 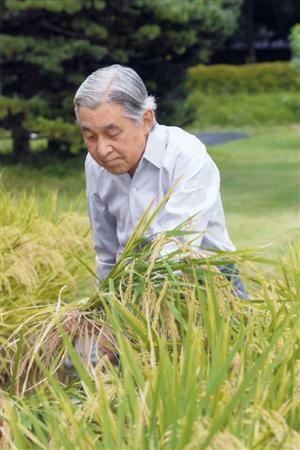 Mr. Niwau also thinks Japanese agriculture can be internationally competitive, that it could thrive in markets that were completely open, and that even rice would be price competitive if the tariffs were removed. The key, he says, is to reform misguided government policy and amend current land use laws that encourage acreage reduction to prop up rice prices. Kon Kichinori, the editor of the aforementioned Nogyo Keieisha summarized the view of the optimists in a recent article in Diamond Online. Here’s most of it in English. 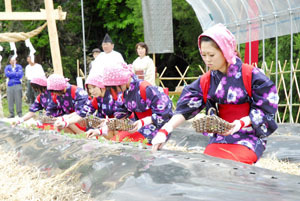 Japanese agriculture is often thought to be suffering from declining numbers of agricultural workers, the aging of the agricultural workforce, small-scale farming, and the lack of competition. The backdrop to these assertions is the historical view of an impoverished peasantry, in which farm households are poor and weak. This view still survives in the contemporary administration of agricultural affairs. But we have already developed a dynamic class of agribusiness entrepreneurs, and it is time for us to abandon the romantic historical view of an impoverished peasantry. This view is based on the historical awareness of the meager harvests and famines of the Edo period when farm productivity was poor. Another factor is the hardships resulting from the high percentage of production confiscated in annual tributes, in which the public sector took 50% or 60% of the crop. This awareness has changed, however, as more research has been conducted into the original documents of the Edo period. Based on surveys from the 16th century, it has been shown that the public sector share of annual tributes fell to 30% to 40% as new technology for agricultural production was developed, and in some cases below that. In addition, the production of such highly profitable products (other than rice) of tea, mulberries, cotton, vegetables, and tobacco rose in tandem with urbanization. The concept of postwar agricultural reform has been based on the theme of the liberation of the poor peasantry. Laws related to farmland and agricultural cooperatives designed to protect smallholding farmers are still on the books. The historical view of an impoverished peasantry has been the premise of the characterization of agricultural issues as the declining numbers of agricultural workers, the aging of the agricultural workforce, small-scale farming, and the lack of competition. Farm households, however, are defined as those with at least 10 ares under cultivation (one are = 100 square meters), or with at least JPY 150,000 in sales of agricultural products. Thus the term “farm household” is a concept that represents households, rather than an occupation. It does not refer to the people who sell their agricultural products. Even those people who have retired from regular jobs and have begun to cultivate at least 10 ares of land to distribute the crop to their relatives as an old-age pastime are counted as agribusinessmen. (Slightly less than 10% of farming households who sell their products report no sales at all.) The average age of 65.8 does not indicate the advanced age of the farm households with people involved in crop production. Rather, it indicates nothing more than the advanced aging of society itself. Apart from the issue of aging, the decline in the number of farm households — even though it is a desirable change — is viewed as a problem, and utilized to proclaim the waning of agriculture. 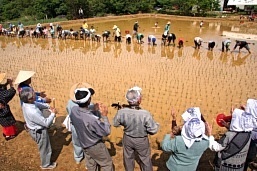 Most of the households known as farming households in Japan are those headed by salarymen, in which one of the grandfathers grows rice on several dozen ares of land. 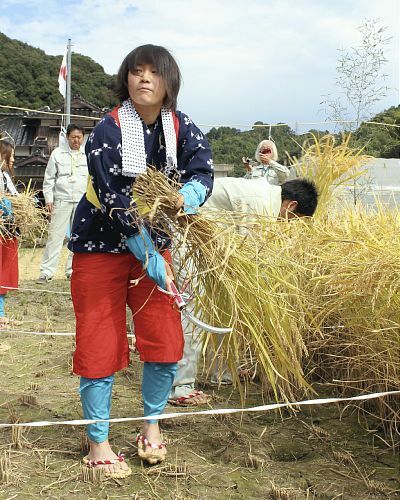 They won’t stop growing rice even if they lose a lot of money — it’s become part of their lives as well as a pleasant avocation. But the productivity and technological level of the hobbyist rice farmers is of course declining. There are some exceptional producers among those associated with the agricultural cooperatives, but the rice produced by small scale farmers with such self-satisfaction is mixed in the drying facilities with the crop from the producers associated with the cooperatives. The result is a deterioration and variation in rice quality due to small production units and the inability to properly conduct cultivation. 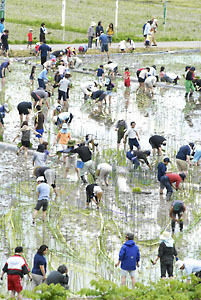 The declining labor productivity of the hobbyist farmer who has lost his sense of professionalism has caused the quality of Japanese rice to worsen. The agriculture industry insists that Japanese rice will be overwhelmed by the foreign product if the high tariffs are eliminated. 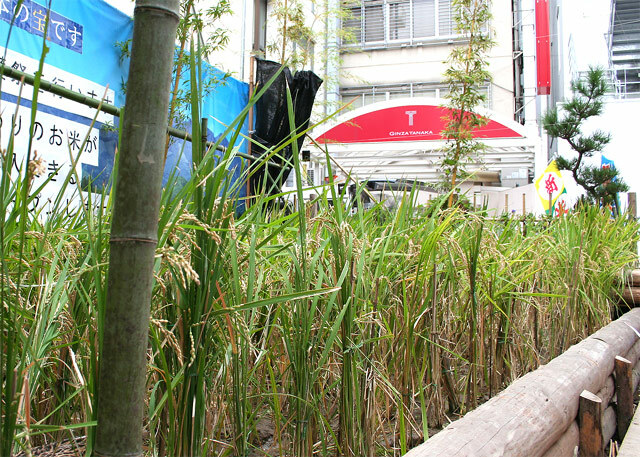 It is very possible that foreign rice will become dominant if foreign rice and Japanese rice are of the same quality. But the Japanese consumer will probably select Japanese rice from farm households that grow high quality rice with lower costs, even if it is more expensive. It is undoubtedly true there are aspects to agriculture that cannot be explained just from the industry perspective, which claims that it has maintained rural settlements and transmitted culture. Those people involved with agriculture who use that as a reason to cling to the historical view of an impoverished peasantry are preventing innovation in Japanese agriculture that exceptional agribusiness entrepreneurs are achieving. If they continue to insist on the fragility of Japanese agriculture, it is because they can harvest the benefits of protection through their defeatism. We have already developed a dynamic class of agribusinessmen. If we abandon the romantic historical view of an impoverished peasantry, we will begin to see the great potential in Japanese agriculture and agricultural villages. The liberalization of trade has long been a matter for debate. In the end, liberalization is desirable for Japan’s national interest. The logic that trade liberalization is desirable has been demonstrated for the past 200 years in the field of economics. This wisdom is also the shared heritage of the world. While there are of course negative aspects to trade liberalization, we know the benefits will outweigh these over the long term. Specifically, the trial calculations of the Cabinet Office finds the losses of joining the TPP to be about JPY 8 trillion, but the benefits to be more than JPY 11 trillion. The negative aspects would be borne by the domestic producers in agriculture, while the benefits would be enjoyed by consumers and exporters. While there is some variation in the calculations depending on the preconditions applied, there is no change in the conclusion that the benefits outweigh the disadvantages. Even the economists, who are always mocked for their divergence of opinions, agree that trade liberalization will result in benefits. It is the job of politicians to determine how to make adjustments and redistribute the positives of trade liberalization to the negatives. This could create a situation in which no one in Japan suffers. The politicians opposed to TPP have abandoned the original intent of their jobs. The principles that have survived throughout history demonstrate there are more than a few errors in the many arguments opposed to TPP. There is the argument that TPP will destroy Japanese agriculture. But the claim that opening the market will kill agriculture is incorrect. This is clear from the example of the liberalization of American cherry imports. When the import of American cherries was allowed, some were opposed and claimed it would destroy the Japanese cherry sector. In fact, however, domestic cherry growers differentiated their product by upgrading the quality. The value of production soared by 1.5 times from 1977 to 2005. During the same period, the producers who avoid liberalization and cling to protection — rice — have become moribund. It is a fact that the producers who improved their strengths while having to compete due to liberalization — cherries — have grown. There is even the extreme view that TPP will inevitably lead to the end of all tariffs. But there are always exceptions in international negotiations. Even in the original TPP talks with four countries, about 10% of the categories were exempted. Besides, the tariffs would not be eliminated immediately, but in stages. Long-term liberalization of more than 10 years has been sought by Chile for milk products and New Zealand for textiles and footwear. Some argue that once Japan enters negotiations, it will have to participate. No international agreements and frameworks, however, have content that is determined from the start. That content is always determined through negotiation. There are many instances of countries entering negotiations and then not participating. There are also instances of countries that have compromised in negotiations and then not participated because they could not receive the approval of national legislatures. At any rate, the arguments opposed to TPP are banalities that have been presented throughout the world over the years. At the same time, they provide people with important information: It enables them to clearly understand just who has the vested interests. No matter how much they say it is good for the people, if we carefully examine their claims, we will understand who has the vested interests, and who does not want to lose those interests. This is valuable information, so we must be always vigilant. One thing we should keep in mind is that the high yen will minimize the advantages of TPP, making adjustment difficult. The government must work toward a lower yen to maximize the benefits of TPP. Yesterday (the 10th), in order to obtain some insights into the revitalization of agriculture, I observed agricultural areas in Gunma Prefecture where people are engaged in leading-edge efforts such as the production of premium brand rice and the operation of direct-sales storefronts. Under the penetrating clear autumn sky, I was able to feel the fruitful nature of autumn throughout my entire being. In what ways can the national government assist in order to revitalize agriculture and transform it into a growth industry? The best way to assist is to get out of the way. 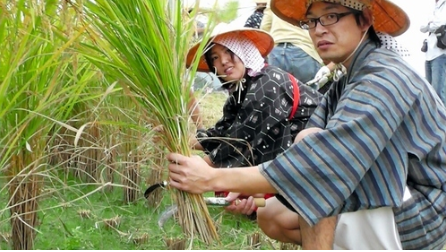 Events on the ground are providing support for the people who think Japanese agriculture has the potential to be a growth industry without government help. The Diet relaxed the regulations on farmland rental in December 2009 (a step little noted at the time, which at long last puts one in the plus column for the DPJ). Since then, there have been, or will be by next year, 120 instances of companies from other sectors leasing land to grow crops. One of them is the railroad company JR Kyushu, one of the six companies spun off from the 1987 privatization of the state-run railroad. They started by growing nira, or Chinese chives, on 0.4 hectares in Oita Prefecture last year and harvested 20 tons for use in their restaurant chain in China or sale on the market. 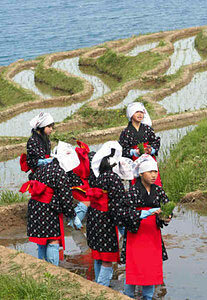 They expanded their area of cultivation to 3.5 hectares this year and project JPY 10 million in revenue. Their initial efforts have been so successful, JR Kyushu’s agricultural subsidiary plans to diversify into citrus fruit, cherry tomatoes, and chickens. 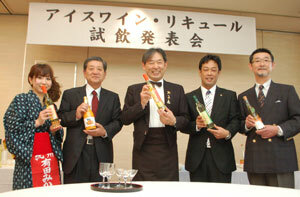 Their target is JPY 1 billion in revenue in two or three more years. Also in Kyushu, the Saibu Gas utility is growing lettuce, the retailer Yazuya is growing strawberries and melons, and Kyudenko, primarily engaged in providing electric power facility engineering services, is growing olives. Other companies are producing tea, onions, shellfish, and organic vegetables. On one side of the debate is the private sector, convinced that Japan can become an agricultural superpower, and that they can get gloriously rich by feeding the nation and helping to feed the world. The people standing in their way are those who always block progress everywhere. They are the romanticists who cling to a vision that was never real to begin with, and the wolf-criers who thunder about a foreign takeover that never occurs. (If it didn’t happen after the postwar Allied occupation, it ain’t going to happen.) Then there are the Ag Ministry bureaucrats protecting their turf, and the beetle-browed politicians who pander to them all to justify their existence when everyone else knows their most productive contribution would be to disappear. What is likely to happen? As always, it will be a minor miracle if the sensible people win. If Japan joins the TPP after negotiating a treaty that it believes is fair, and the politicians can be prevented from spending everyone else’s money to buy off compensate the small farmers (particularly without Diet redistricting that gives those regions more seats than they deserve) it will be a miracle of Lourdesian proportions. Here’s a different look at the benefits of open markets in the Taiwanese mod/trad group A Moving Sound’s performance of the Market Song. Note the American man playing the moon lute, a Chinese woman playing the cello, and the use of the electric bass to present a fresh take on an old sound. PLENTY of people were saying plenty of interesting things last week with the start of the Noda Cabinet. Here are some of them. Having an advocate of tax hikes as prime minister is a dream come true for Finance Ministry mandarins who have long championed an increase in the consumption tax rate. Senior Finance Ministry officials asked Noda to appoint either former Secretary-General Katsuya Okada or former Deputy Chief Cabinet Secretary Yoshito Sengoku as finance minister because both men support tax increases. Eventually, Noda picked Azumi Jun, handing him his first Cabinet portfolio. “Noda chose a lightweight minister without losing any sleep over the matter because he served as finance minister himself,” a DPJ lawmaker said. That last sentence is clever for the plausible deniability it provides. Did they mean Mr. Noda isn’t losing any sleep because he is capable of acting as his own finance minister, or because he was a lightweight finance minister himself who subcontracted policy decisions to the ministry. I suspect the latter. I don’t recall much of this from the Asahi when Kan Naoto, the preceding Finance Ministry puppet and tax hike promoter, was in office, but perhaps I disremember. Please note that I’m still having trouble with the link function. I just sent a note to WordPress. The article should be easy to find, however. It’s worth reading anything by Mr. Hasegawa, an award-winning book author, columnist, and member of the editorial board of the Tokyo Shimbun. Here are some excerpts from an article in Gendai Business Online commenting on Noda Yoshihiko’s use of the term “no side” after winning the DPJ presidential election. The phrase comes from rugby and is (or at least was) used by the referee to signal the end of the match. I’ve read that it’s obsolete, but being from a country that doesn’t play rugby, you could fool me. Japanese politicians often use it in this context to call for party unity. “The use of the expression “no side” is straight from the Liberal-Democratic Party politics of a generation ago. “In those days, Kasumigaseki (the bureaucracy) handled all the policy questions. Policy was essentially identical to that which they created, so the politicians in Nagata-cho promoted themselves using traits unrelated to the core of policy, such as decision and execution, or tolerance and compassion. It could even be said they had no other way to compete than to emphasize their capacity to execute policies or their broad-mindedness. “People understood that politics of that sort was a failure, so the Democratic Party championed the cause of disassociation from the bureaucracy and political leadership during the general election two years ago. The politicians said they would retrieve policy from the hands of the bureaucracy. In the end, however, they were ensnared by Kasumigaseki, and their effort at eliminating the reliance on the bureaucracy failed. We’re now in the third DPJ government with the Noda administration, and there’s nothing else to say but “no side”…. “….The “no side” politics are unlikely to be successful because politics that are carried piggy-back by Kasumigaseki no longer functions. Kasumigaseki has gotten too big. It micromanages everything in the private sector (literally, every time [the private sector] raises or lowers its chopsticks), and maintains a system of skimming off taxes through amakudari. There will be no revival for the Japanese economy. “The recognition that the root cause of the economy’s stagnation is the system of Kasumigaseki leadership has begun to spread throughout the population due to the bitter experience of the Tohoku disaster and the Fukushima accident. In Nagata-cho, they are beginning to realize that perception is growing. “Many Democratic Party MPs are in a mouth-to-mouth feeding relationship with Kasumigaseki, and the politicians have noticed they’ll be at risk in the next election. While Noda won the DPJ election, many within the party are still opposed to a tax increase. “The euphoria following the selection of the new party president had an immediate feel-good effect, but the Diet members will shortly return to reality. The turbulence will reemerge with a vengeance as soon as a serious effort is made to pursue a policy of higher taxes. “What’s more, that day will soon arrive. They’re now at the stage of formulating a third supplementary budget calling for an increase in core taxes as a funding source for Tohoku reconstruction. They also plan to present a bill by next March to raise the consumption tax to fund social welfare. In short, the debate begins in the fall. The first of the highly publicized governmental policy reviews held by the DPJ in November 2009 was one of the most transparent political dog-and-pony shows ever staged. The idea was that the politicians would put the bureaucrats’ feet to the fire by grilling them about questionable policies. They would end the wasteful enterprises and use the money to fund their campaign promises. It didn’t take long to find out that the reviews were scripted — literally — by the Budget Bureau of the Finance Ministry, complete with recommendations on which policies to cut. It was a convenient way for the ministry to strengthen its control relative to the other ministries. Further, the recommendations of the review panel had no force in law. Some of the programs ostensibly cut, such as one for the Education Ministry, were quietly restored into the budget of a different ministry a few months later. But it seems there’s been a late summer thaw. Construction began on 1 September of an 800-unit apartment block in Asaka, Saitama. Whatever debate was conducted about lifting the freeze hasn’t been reported, and there’s no indication the Government Revitalization Council was involved. Each of the apartments has a living room, dining room, kitchen, bath, and three extra rooms. The rent and deposit are free, courtesy of the taxpayers. The cost of the project has been estimated at JPY 10.5 billion. Despite a location next door to the Asaka municipal offices, only national civil servants are eligible to live there. It’s prime real estate 10 minutes on foot from the train station. The housing accommodations for national public employees are under the jurisdiction of the Finance Ministry, so the Finance Minister had to give his authorization to end the freeze and begin construction. Based on the timing, that means the person who approved the project in apparent contravention to government policy was the new prime minister, Noda Yoshihiko. How thoughtful of him to let us know. If the government was serious about ending wasteful government expenditures, all these properties would be sold and no new ones built. The private sector has no problem handling housing construction. The public sector has the problem of funding rent-free accommodations for its employees with public funds. “This high support is likely the result of the effect of the Aida Mitsuo poem (about the dojo fish), Mr. Noda’s personal modesty, and the good feelings about the Cabinet selections made with party unity in mind. The polls also probably reflect the reaction to the fact that Mr. Kan was so terrible. “Nonetheless, I think the people of Japan are really kindhearted. (To use the analogy of the traditional wedding present of cash), the amount of the present for a third wedding and honeymoon in two years shouldn’t be the same as it was for the first….If this continues, I am deeply apprehensive about the disappearance of a sense of tension from politics and the politicians. Most politicians are risk-averse opportunists. They’ll look at the going rate for wedding presents. If the Cabinet is a failure, they’ll think all they have to do is replace the head….At any rate, when the yearend budget formulation is finished, the rate of support will have plummeted and the government will again be on the verge of collapse…. Some in the Western media have reported that the new Cabinet has received “strong voter support”. If this is the best they can do when filling space, they should consider syndicated horoscopes instead. The support is nothing more than a first impression, it’s skin deep rather than strong, and since the polls are conducted by random digit dialing, no one knows whether the respondents are voters or not. One doesn’t have to have a long memory to recall that Kan Naoto had even higher ratings in June 2010 when he displaced Hatoyama Yukio and shut Ozawa Ichiro’s supporters out of the Cabinet. As summer turned to fall, however, he lost more than 40 points in one newspaper poll in two months over his government’s mishandling of the Senkakus incident. Mr. Noda’s numbers are only a tad better than those of the LDP’s Fukuda Yasuo when he took over in 2007, and he lasted just a year. Besides, there’s no reason to pay serious attention to what the foreign media writes about Japanese politics until they demonstrate that they understand most Japanese prime ministers aren’t “leaders” as understood in the Western sense, but the principal spokesmen for the decisions of their party. The obvious exception was Koizumi Jun’ichiro. His successor Abe Shinzo tried to do the same, and did have some success (as the next excerpt shows). But Mr. Koizumi was an act nearly impossible to follow, and the primary audience was a news media more irritated than a pack of gunpowder-fed junkyard dogs after five years of success and popularity by someone who wasn’t a European-style social democrat. Kan Naoto tried too, but because character is one of the prerequisites for leadership, he was unlikely to succeed from the start. Mr. Okazaki was once ambassador to Thailand, and he writes on diplomacy and foreign affairs. Here are some excerpts from a piece that appeared in the Sankei Shimbun. “They get the sequence backwards when they ask for experts’ opinions after something has happened. They should be listening to opinions regularly, and when something happens, they must decide. Their subordinates are already busy, and the excessive workload of selecting and convening the members of a commission is too heavy…. “If they’ve learned the lesson that the people have suffered and had to bear heavy burdens since they’ve taken power, it will be a positive for the two-party system in the future. Most important, I think, has been the generational change….In the DPJ, the generation of radical student demonstrators has left the scene, and they’ve moved on to the next generation. “With the new administration, they should not be so niggardly as to worry about the DPJ recovering its reputation and the effect that would have on the next election. If there is an offer to cooperate on policy, it would be best for them to humbly accept it and cooperate. It’s more important to deal with the crisis in Japan of the continuing (political) vacuum. 26,000 former national civil servants have taken amakudari jobs in 4,700 (public) corporations, and JPY 12.6 billion of hard-earned tax money flows to these amakudari corporations annually. No matter what budgets we formulate, we will be unable to overcome our economic crisis until this gimmickry is ended. The facile recognition of an increase in the consumption tax represents the suspension of thought, and it ends the elucidation of such gimmicks as the wasteful use of the special account. The aforementioned Eda Kenji thinks it’s impossible for the DPJ to reform the civil service system because they depend on public union support. We’ve attacked the ruling party by saying, for example, that the child allowance was just an example of doling out of baramaki, i.e., lavish entitlements (which it was) and we made them stop. But I cannot say the LDP has explained how it will support child-rearing. And neither does it have any business supporting child-rearing. They can explain that government can best support child-rearing by creating an environment in which the economy thrives and allowing parents to handle child-rearing by themselves. In other words, by butting out. The heart of the plan lowers all tax rates on individuals and businesses. Mr. Huntsman would create three personal income tax rates—8%, 14% and 23%—and pay for this in a “revenue-neutral” way by eliminating “all deductions and credits.” This tracks with the proposals of the bipartisan Bowles-Simpson commission and others for a flatter, more efficient tax system. Mr. Huntsman would repeal two of President Obama’s most economically debilitating creations, ObamaCare and the Dodd-Frank financial regulation law. Mr. Huntsman has it right when he says, “Dodd-Frank perpetuates ‘too big to fail’ by codifying a regime that incentivizes firms to become too big to fail.” He’d also repeal a Bush-era regulatory mistake, the Sarbanes-Oxley accounting rules, which have added millions of dollars of costs to businesses with little positive effect. Mr. Huntsman says he’d also bring to heel the hyper-regulators at the Environmental Protection Agency, Food and Drug Administration and the National Labor Relations Board, all of which are suppressing job-creation. In addition to the foregoing, Mr. Kono should consider restoring the policies to promote agribusiness that were begun under the Abe administration and ended under the Hatoyama administration. There was quite a bit of unused farmland in Fukushima Prefecture, to cite one example, even before the nuclear accident. The DPJ chose to offer baramaki in the form of individual farming household supplements to take advantage of the disproportionate representation of agricultural regions in the Diet for electoral purposes. Both Japan and Mr. Huntsman would also do well to heed the success of Russia, which introduced a 13% flat tax a decade ago. That resulted in a string of annual budget surpluses that started in 2001. They had a deficit of 3.6% of GDP in 2009, not the best of years for government budgets, but were back into surplus last year. If the legislative authority be not restrained, there can be neither liberty nor stability. 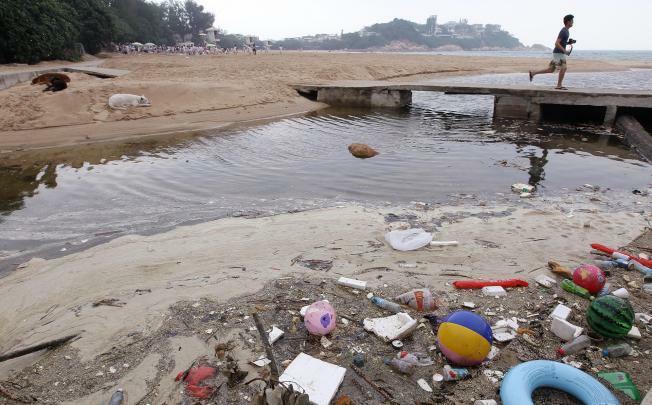 However the legislative power may be formed, it will, if disposed, be able to ruin the country. And Morris wasn’t a classical liberal — he believed in a natural aristocracy. The sharp appreciation of the yen hasn’t been all bad for Japanese businesses. Japanese companies are shopping till they drop in corporate supermarkets overseas now that prices are at bargain levels. According to M&A originator and executor Recof, their purchases of overseas firms from January to August alone were valued at JPY 3.8842 trillion, already more than last year’s JPY 3.7596 trillion. They amounted to JPY 465.8 billion in August, double the amount for July. The buying is on a pace equivalent to that of the second-highest year, 2008, when JPY 7.4256 trillion was spent to snap up overseas corporations. Recently Kirin Holdings bought a large Brazilian beverage company, and Asahi Holdings now owns an Australia/New Zealand-based liquor manufacturer. Typhoon Talas dumped record amounts of rain in western and central Japan on Sunday, killing at least 25 people and stranding thousands as it turned towns into lakes, washed away cars and set off mudslides that buried or destroyed houses. Forget the AP’s frustrated novelist prose — What is this “Typhoon Talas” of which they speak, which isn’t a name a Japanese person would come up with? Here in Japan, it’s Typhoon #12. It turns out to be the creation of the Typhoon Committee of the United Nations Economic and Social Commission for Asia and the Pacific, and the World Meteorological Organization, a revealing bit of nomenclature itself. While those bodies need a way to quickly differentiate the storms, how is their function enhanced by names they don’t need and no one other than they or the news media use? The two lists most Americans are familiar with cover the Atlantic and East Pacific. But there are also lists with culturally appropriate names that cover the Central North Pacific, Western North Pacific, Australian Region, Fiji Region, Papua New Guinea Region, Philippine Region, Northern and Southern Indian Ocean. In other words, it would be news to Discovery News to discover that Talas isn’t “culturally appropriate” for Japan, the only country affected by WNP #12. Yeah. The way the Japanese do it. Sounds like an Okinawan/Indonesian blend to me.